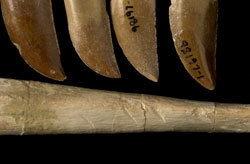 "My best birthday present ever was a fossil hunting kit." Dr. Kristi Curry-Rogers always knew she would be a paleontologist. "I fell in love with paleontology when I was only 5. I have a memory of being in 2nd. Grade and drawing a picture of what I wanted to be when I grew up - I drew a paleontologist! I spent a lot of time at the library learning about the fossils that were found around my hometown in southern Missouri, and spent even more time on fossil hunts in my neighbor's rock garden." Dr. Curry-Rogers says she didn't play with dinosaur toys but was more interested in the nuts and bolts of paleontology…setting up a preparation lab and library in her bedroom. "My best birthday present ever was a fossil hunting kit that included a tough looking backpack, rock hammer, some books and (of course, it was from my parent!) safety glasses." Kristi is now the curator of Paleontology at the Science Museum of Minnesota and a visiting assistant professor of Geology at Macalester College. She holds a B.Sc. in Biology from Montana State University, and a M.Sc. Ph.D. in Anatomical Science from the State University of New York at Stony Brook. She is a vertebrate paleontologist, which means she studies animals with backbones. She explained her specialties to MY HERO. "I think I have two real specialties. 1. The long-necked, plant eating, giant dinosaurs. 2. Dinosaur growth rates. *(See Bone Histology in Extra Information) I'm really interested in learning about how dinosaurs made their living, and so I focus on all sorts of the biology - from how fast they grew, to how they evolved." Dr. Curry-Rogers is married to fellow scientist, Geologist Ray Rogers. They first met at an annual paleontology meeting, when Kristi was 19 but didn't take much notice of each other. But 4 years later, says Curry-Rogers, "we met up again on an expedition to Zimbabwe, where he was the project geologist and the rest is history! We actually love working together - I view him as my "personal geologist" and I think that he sees me as his "personal paleontologist". We've been around the world together in search of dinosaurs and interesting rocks and have really had amazing shared experiences. It is a special thing to be able to relate so well to the work that we each have to do, as well as the discoveries and excitement that they bring." They have a little girl named Lucy who, at the ripe old age of 2, is a veteran of dinosaur digs. "Ray and I have had lots of luck so far bringing Lucy along to the field with us, as well as to museums all over the place. We love being able to bring her with us and will try to do so as often as possible." Most of their travels occur in the summer or winter. "Lucy will probably think that ALL kids go dinosaur hunting in the summer." 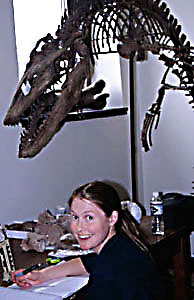 Dr. Kristi Curry-Rogers has participated in many digs in the United States, Africa and Madagascar and along with her husband, geologist Ray Rogers and colleague David Krause, made the revolutionary discovery of cannibalism in dinosaurs. Their findings, published in the prestigous Science journal, NATURE in 2003, show the MAJUNGATHOLUS' own tooth marks match the marks on MAJUNGATHOLUS bones. The Majungatholus atopus, a 30 foot long meat-eating dinosaur lived in Madagascar about 65 million years ago. In this Late Cretaceous time period, the environment in Madagascar experienced volatile swings in the availability of food and water, leading to mass die-offs among the animal population. According to Ray Rogers, "It appears as though Majungatholus atopus exploited all available resources, even if it meant dining on members of its own species." MY HERO asked Kristi what her thoughts are on this discovery, now that several years have passed. She said, "All of the members of our larger Mahajanga Basin Project team are still working on aspects of Majungatholus, from basic anatomy, to evolutionary relationships, to understanding its environment and interactions with fellow dinosaurs. I think that Majungatholus is among the best understood of all meat-eating dinosaurs and the discovery of cannibalism really gave us an insightful look at an interesting, but not all that unexpected behavior for an animal living in a really tough environment." Dr. Curry-Rogers is going back to Madagascar in a few weeks time. I asked her to tell MY HERO what a typical day would look like and what she would be looking for this time. "I'm so excited to be heading back to Madagascar! It will be the first time for me in several years, so I'm excited to see what new things there are to discover, but also to try out the Malagasy that I've been learning this year. Our days in the field are actually pretty variable. For the first few days of our trip, we'll be in the capital city of Madagascar - Antananarivo, meeting officials, preparing our crates to go north to the field area, and giving lectures at the university. We're also heading down south, to an area where I've not yet been, because all the paleontologists in our group are active in a non-profit organization called the ANKIZY FUND (www.ankizy.org) dedicated to improving the healthcare and education of Malagasy kids. We're inaugurating a school that the fund helped build. Finally, we'll head north to the field area where we'll spend most of the trip in the northwest corner of Madagascar. We live in tents in the village of Berivotra, and head out early every morning to prospect for fossils, dig in quarries, or collect geological samples. My favorite parts are the hiking, searching, and exploring. I'm in search of more fossil material of two new species of long-necked dinosaurs (one of which I got to name - Rapetosaurus krausei, after a legendary giant in Malagasy folklore) - we have really nice fossils of Rapetosaurus, but the other sauropod is still pretty mysterious. We only know a little bit about it from its skull, and I hope to discover some other parts of its skeleton this summer. Wish me luck!" Asked what it was like for a budding paleontologist to see Jurassic Park…Kristi replied: "I actually saw Jurassic Park during my first year in college, when it opened at a local theatre in Bozeman, MT. It was awesome, mostly because one of the paleontological inspirations for the character of Dr. Grant (Jack Horner) was my advisor in undergraduate school, and he'd been a science advisor on the movie. It was fun to get an "inside scoop" and really amazing to see such life-like dinosaurs on the big screen." Do you have any advice for kids who want to grow up to be a scientist? "I think that the best advice is to stick to your guns, and jump at opportunities that give you experiences related to your dreams. Try and meet people who you admire and ask as many questions as you can. Most importantly…ask GOOD questions." Who is your hero and why? "I have lots of heroes and only a few of them are paleontologists. I'm really inspired by people who teach and especially teachers that encourage kids to follow their dreams. For me, it was my 6th grade english teacher, Mrs. Dockins, and a local paleontologist, Mr. Parkinson, that I met when I was just a kid." What do you do for fun? "I love playing with my daughter Lucy, and hanging out with my step-daughter Katie. When I'm on my own, I love hiking and just being outside, and spend lots of time going on runs, reading novels and drinking coffee in cafes with my husband." MY HERO wishes Dr. Kristi Curry-Rogers and her Madagascar team LOTS OF LUCK! To keep an eye on her findings…go to her website at the Science Museum (http://www.smm.org/research/Paleontology/). One of America's premier science centers, with a world class dinosaur collection and great stuff for kids. The MAF is a non-profit fund for the education and health care of Malagasy children. Its goal is to build schools and clinics in remote areas of the island. Tons of info on Paleontology. According to Dr. Kristi Curry-Rogers, "There's a good evolutionary reason for growing quickly. Basically, you have to grow fast so you can beat out the predators and be an adult and reach sexual maturity in time to actually reproduce and send your genes on through the gene pool." Because the bones of modern day reptiles grow slowly scientists thought dinosaurs grew slowly as well. Experts had thought the huge Apatosaurus would have taken up to 120 years to grow to its full length of 70 - 90 feet. Curry-Rogers thought differently and when she found some Apatosaurus bones in Montana she determined to find out the rate of growth. She knew the record of an animals growth was contained in the interior of its bones, so she set up a 1/10 mm thick bone slice to be viewed under a microscope. The patterns left by the blood vessels in the bone would be arranged in an orderly fashion - if the animal had grown slowly. But, Curry-Rogers found that the blood vessels were arranged in an irregular pattern. She concluded that the Apatosaurus may have reached its full size in as little time as 10 - 12 years.